Throughout the process of an analytical investigation, sample preparation - as opposed to the subsequent analytical steps - is the most time-consuming part. Excellent quality and extreme care during the process are essential for a functional analysis. The use of two magnetrons with a total power of 2000 W significantly increases performance, enabling digestion of difficult sample materials. Speedwave Xpert with its robust swivel cover allows rotors to be loaded individually in the oven chamber. No tedious insertion and positioning of the rotor, vessel and sensors is required. During digestion at high pressures and temperatures especially, the monitoring of all reaction parameters is essential. 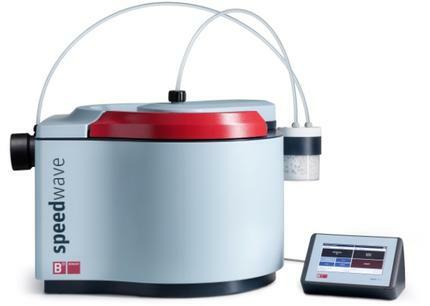 Speedwave Xpert measures sample temperatures as standard in all of the individual digestion vessels in real time using optical measuring techniques. In addition to the contact-free measurement of the internal vessel temperature, for which the use of reference vessels is not required, the external temperature of the vessels is also monitored in order to ensure a long service life for the digestion containers. Pressure measurement is also guaranteed in all digestion vessels thanks to optical measuring methods. The output of the magnetron is continuously adapted based on the temperature and pressure information. The risk of spontaneous reactions is reduced to a minimum and user safety is significantly increased. The Speedwave Xpert fans are controlled dynamically as a function of the magnetron temperature. As a result, the volume during digestion is significantly reduced compared to other similar models. Speedwave Xpert has a clearly structured external control unit that features intuitive operation. The large, high-resolution touchscreen display makes visualisation easier. Users are guided through the menu and can start the digestion process after just a few inputs. The device can also be controlled using mobile terminals. Monitoring, data transfer and documentation are therefore incredibly simple. The extensive application database assists you in selecting the right digestion programme. All digestion containers are made entirely from TFM™ PTFE and are made up of just three individual components. The vessels are opened and closed without any additional tools. The large internal diameter makes cleaning exceptionally simple. Various vessel capacities are available for all kinds of applications. At Berghof, digestion vessels are not regarded as consumables, but instead are part of the device guarantee. In combination with the long service life of 3-5 years, the operating costs for users are transparent. This represents significantly tangible added value for sustainable and cost-effective laboratory management. Space-saving digestion system for routine tasks in which high numbers of specimens must be handled in a reproducible and cost-effective way over a short period of time. We provide the necessary expertise through workshops and individual demonstrations. A network of trained retailers and technical service staff ensure that help is close at hand should you have any questions. We look forward to your call.